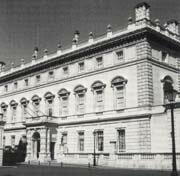 The exterior of this Grade I Listed house, designed by Sir Charles Barry, was initially repaired by Triton in 1989 and subsequently refurbished in 1998. In Spring 2005 Triton are likely to undertake substantial masonry works at roof level as part of the cyclical maintenance programme. All the Portland stone elevations were water cleaned and localised iron stains removed by poulticing. Extensive indenting of previous in-situ repairs were undertaken, using the Perryfield Whitbed variety of Portland stone selected from the Triton Building Restoration stone library. At high level, the balustrade was partially dismantled and reconstructed, prior to the application of a graded shelter coat. Ornate carved stone, including dolphin's heads to the cymatium, and large vermiculated urns were supplied and fitted. Structurally, the building is in good condition and well maintained. Repairs to the roof included replacement of slates in isolated areas and renewal of asphalt where necessary. Leadwork to the main cornice of both the house and stable block was reinstated with Code 8 lead and to complete, the painted elevations were redecorated using the Keim mineral paint system. Further masonry works, undertaken as part of previous contracts, include the construction of a new west boundary wall, replacement copings to the north boundary wall and new York stone paving throughout the garden. Simon Danischewsky RIBA AADip MAPM ACIArb, House Architect at Bridgewater House: ".. we have no hesitation in making the best of recommendations in respect to the quality and standard of work achieved and the professional manner in which Triton have executed and completed their projects with us. Their approach is very much of a 'can do' philosophy, instinctively co-operative and non-adversarial. We would have no hesitation in recommending them without qualification."